Scooper - Technology News: The incredible story of developing country income growth: was it just China? The incredible story of developing country income growth: was it just China? To what extent has the age of globalization benefited developing countries —and what of the poor in those countries? To what extent has such progress been driven by local policy decisions rather than a more global phenomenon? Has such development come alongside stagnation of poor and middle incomes within more developed countries and large benefited the extremely rich? 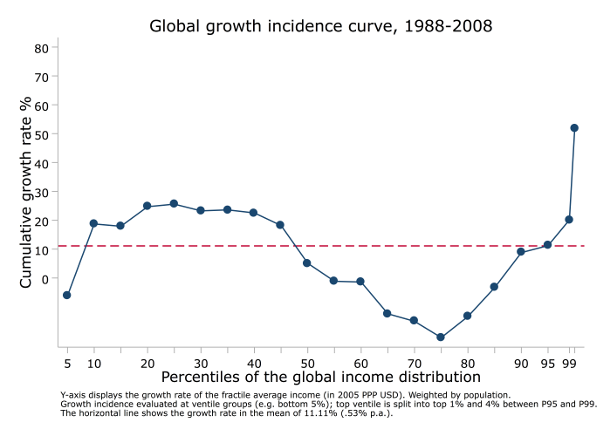 One way—however incomplete—to begin an investigation would be to look at the global “growth incidence curve” (GIC) of Lakner and Milanovic. 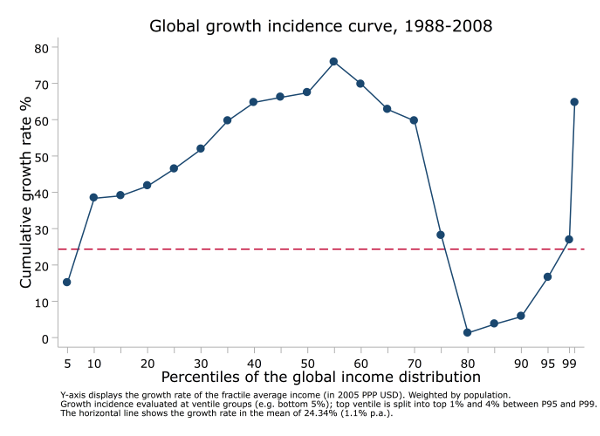 They estimate the worldwide distributions of income in both 1988 and 2008, which allows them to answer questions such as “How does median (the 50th percentile) income change between the two years.” The GIC is sometimes referred to as the “elephant curve” for its resemblance to the beast. Figure 1 shows the worldwide GIC as produced directly by Lakner and Milanovic’s public data and code . 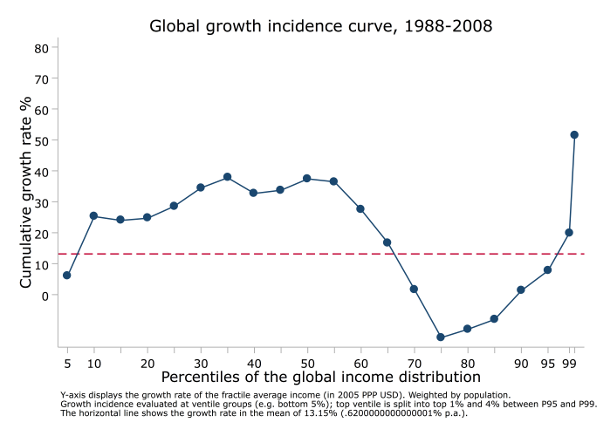 Without China, growth is much slower and flatter over most of the income distribution. Within the bottom 99 percent, the fastest growth lay in the 20th-25th percentiles at less than 26 percent—or 1.1 percent per year. This is not particularly rapid development; on average, countries with similar incomes in 1960 grew almost twice as rapidly. Among more developed nations, progress was far from even. Once China is taken out of the mix, the incomes of the 70th-75th percentiles in 2008 lay on average more than 20 percent below those of the 70th-75th percentiles in 1988. By contrast, in a recent pair of tweets , Milanovic shows the lower half of the income distribution with peak growth of almost 40 percent over the period, as compared with 26 percent above. What might account for this discrepancy? It may be that Milanovic excludes only rural China, but not the urban areas. The data used by Lakner and Milanovic to produce the global curve distinguishes between urban and rural China—treating them as distinct units. (They treat India and Indonesia similarly.) If we exclude only rural China from the data , the program of Lakner and Milanovic produces results strikingly similar to those seen in Figure 3. This is shown in Figure 4. For the developing world, at best we see in Figure 3 growth as high as 38 percent. Further up the distribution—at the 70th-75th percentiles—average income in 2008 was 14 percent below that of the same percentiles in 1988. It thus appears that Figure 3 is based on excluding only rural China. If we exclude China entirely, we get the results in Figure 2, which show a much bigger change in the GIC curve. This is important. 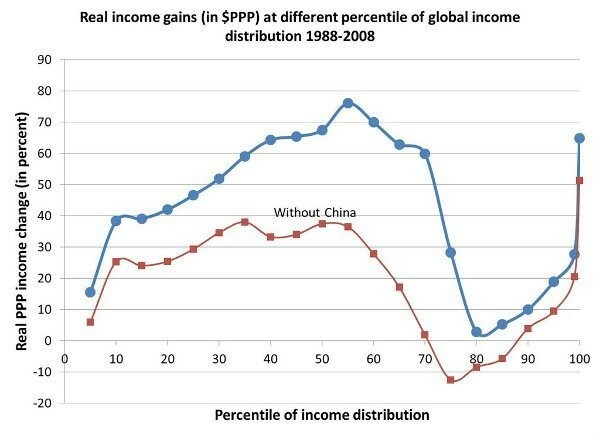 The greater movement in the GIC curve when China is excluded suggests a very different story about the success or failure of a set of policies that were implemented mostly in the 1980s and 1990s, sometimes referred to as neoliberalism, or “globalization” for the international component of them. China implemented different policies, often in opposition to reforms that much of the rest of the world was adopting (e.g. state ownership of most the banking system, government control over most investment including foreign direct investment, industrial policy, and lax enforcement of intellectual property rights.) If this period’s successes in development are mostly driven by China, then we may reach different conclusions regarding the success of widespread global reforms.